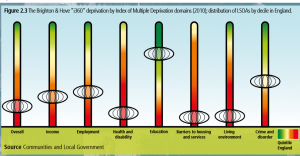 The report is using some interesting infographics – this one compares B&Hs areas of multiple deprivation with other such areas nationally. 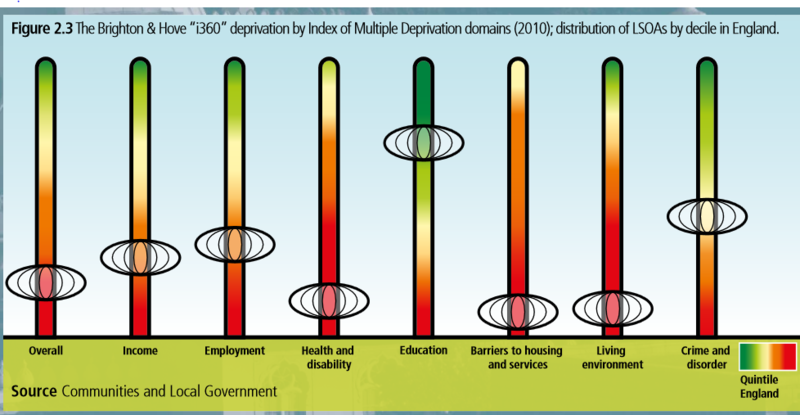 It shows how in B&H there are high educational levels in our deprived areas, but for health and housing the city is one of the worst. Our new Infant Feeding and Public Health module will be offered in May 2016. This is an optional module, and looks at infant feeding from a coordination or commissioning perspective. For students with a strong interest in nutrition it complements the Nutrition in Public Health module offered via the medical school programme; taken together would give your MA Health Promotion a thorough Nutrition Promotion underpinning, ideal if you want to look at nutrition in your dissertation. The curriculum – and some of the speakers – draws on the WHO/UNICEF Breastfeeding: Practice and Policy Course which Carol co-directed for more than 10 years at UCL-Institute of Child Health before joining University of Brighton. It can also be taken as a single module, with or without the assessment. It would be an ideal ‘taster module’ if anyone wants to try out what masters level study at University of Brighton is like.